Those of us in the musical theatre trenches know the power of Joan’s message in our work with young performers. Rather than operating in isolation, we can take her cue to train collaboratively with shared goals and strategies. This is Joan Melton’s eloquent charge to teachers and performers. The whole is considerably greater than the sum of its parts. Excellent book! Useful tool for actors, dancers and singers, and those who teach those disciplines and are interested in their integration. What a unique area of research! Loved the interviews and analysis. I could clearly 'hear' your voice throughout and what a wonderful group of interviewees! Many congratulations on such a readable and original book! Building on Singing in Musical Theatre: The Training of Singers and Actors (2007) and One Voice (with Kenneth Tom, 2nd ed. 2012), Joan Melton here brings together research and interviews with teachers and performers to clarify and round-out her work on breath management in performance. While her work focuses specifically on music theatre performers, who must sing while dancing or speak while moving, it applies equally to opera singers, who often face those same demands. For centuries breathing for singing and breathing for dancing have been taught differently. Not only has it been assumed that the breathing technique is different, but different terminologies have traditionally been used. However, the performer needs to work as an integrated whole in communicating with an audience through spoken voice, sung voice, movement and dance. This latest work brings it all together to provide a perspective on performance training to allow a collaborative, holistic, physical approach. The work is presented in an eminently readable form, moving between interviews and research, and drawing it all together in the final chapter, "Widening the Lens." Joan Melton has crafted a wonderful book of research, engaging interviews and exploration into the new frontier of training for a generation of artists in which the current demands of cross-disciplinary performance benefit from a highly integrative approach to skill set in the areas of singing, speaking, dancing, moving, and acting. The book beautifully examines how we are doing what we are doing when skill sets are performed simultaneously. She illuminates consistencies and overlaps without prescribing a “one size fits all” approach to methodology and application, concluding that it is in fact possible to “do it all” without sacrificing one thing for another in performance, while remaining healthy! This book is a valuable and inspiring read for educators, practitioners, and creative artists alike, with innovative techniques and approaches to the collaborative process. I highly recommend this accessible and stimulating resource! Performers are accustomed to receiving their performance knowledge separately, e.g., from a singing teacher, and from a dance instructor. This, while necessary at times, encourages the performer to treat those as separate, and often shows in the body and voice of said performers. Dancing with Voice encourages the amalgamation of that knowledge within the performer, thus allowing performers (both student and established) to begin the journey of integrating their acquired knowledge in a safe and intimate way. Nothing is quite as fascinating as a book that feeds knowledge, stimulates thinking, and provokes questioning. 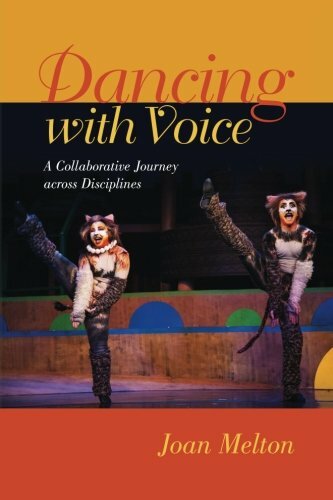 Joan Melton’s Dancing with Voice: A Collaborative Journey across Disciplines does exactly that. Joan Melton is an accomplished singing and voice teacher, researcher, practitioner, and writer who has that excellent additional skill of being able to link ideas and people; in Malcolm Gladwell’s The Tipping Point parlance, she is a Connector. In researching her key curiosity—do dancers and singers breathe differently?—she has divided her work into four sections: Part I, “Interviews with Dancers”; Part II, “Research”; Part III, “Triple Threats on Dancing with Voice”; and Part IV, “Research in Motion.” Dancing with Voice honors the ancient oral tradition of theatre, being derived from conversations with expert practitioners, current researchers, and those in the field trying to make sense of what it is to be a singing, dancing, acting performer. The book comes from many angles making it useful to practitioners, teachers, and students in the field. The triple-threat performer always faces the challenge of combining all skills through one body to focus on performance. While training performers in the voice, singing, or dance studio, the trainer is always conscious of the need for a confluence of breath and breath support information across the disciplines. As a voice teacher who trains actors, singers, and dancers, I found the language and ideas shared through the interviews with dancers invaluable; for example, the head of the dance program at Wagner College, Staten Island, NY, Rusty Curcio’s concepts of space and the breath: “On inhalation you always grow, exhalation you always shrink, so even just in flexion and extension of the body, there is a breath pattern, a breath phrasing that goes along with it”(5). The conversation continues with Melton and Curcio discussing in detail the breath process for dancers and examining whether voice concepts such as range, resonance, and articulation have meaning in the world of dance. The interview with William F. Lett, master teacher of musical theatre in the Department of Theatre and Dance at California State University Fullerton, titled “Putting it All Together,” examines integrating voice into tap dancing. Apart from the fascinating overview of the genealogy of tap, in which Lett describes the body as serving “simultaneously as a percussion (tap)and string/wind (vocals) instrument,” (19) there are other concepts to consider such as “Find that breath, use the body’s momentum to inhale and exhale every time you move, and when you fight it, you’re fighting the movement” (20). Lett also suggests a very pragmatic pelvic floor practice—“just letting go down below versus letting go forward, because if you let go forward you lose your core” (21). In another valuable interview, Francine Zerfas, dancer/actor/voice specialist, speaks from her perspective as a dancer who became a voice teacher, sharing great ideas on the athleticism of breath through the body in action. In Part II, we are treated to discussions of “ground breaking research projects in the UK and Australia” which focus on examining breath management strategies in performance. In the first chapter, Melton collaborates with physiotherapist, Jane Grey to use ultrasound imaging of abdominal support mechanisms while voicing, revealing the vital role of the transversus abdominis in respiratory functioning during performance. They found that the transversus abdominis can release and engage while the superficial abdominal musculature is doing its job of maintaining postural support. The following chapter delves further into the functioning of the abdominal muscles, taking the reader through a very convincing argument in support of the value of understanding and activating the transversus abdominis and sensing the response in the lateral region of the lower abdomen. The final chapter in this section raises an interesting debate on the pelvis—to tilt or not to tilt? By providing subjective and very personal responses gathered from performers across various genres about their perceptions of what tilting or tucking the pelvis actually means to them—the opinions are incredibly wide-ranging—rather than drawing a conclusion, Melton uses this panoply of responses to provoke the reader’s curiosity. The anatomists and movement specialists assert that managing the pelvis forward or backward works against efficient alignment but some singers use pelvic maneuvering to their perceived vocal advantage. This is one of the questions I mentioned earlier; it is certainly “rich territory for research” (58). Part III consists of interviews with three performers that would be extremely useful documents to put in the hands of people in training because they are such an honest synthesis of each performer’s understanding of triple-threat performance. Performer Rin Allen draws in a fourth “threat,” stage combat, noting that breath response in a fight sequence is what makes it truthful and draws a breathing response from the audience. She also makes some fine points about evaluating acoustics as a performer and about the benefits of consciously combining every element of the eventual performance in rehearsal, the key element being the breath. Mara Davi talked about the need for physical stamina for the musical theatre performer and how sensitive choreographers always phrase the dance to enhance the performance of the lyric. Davi underpins earlier discussions of the holistic movement of breath in saying “I do feel like in performance there is that ebb and flow, tension and release, and when you are in this flow, performance feels glorious” (81). John Robert Armstrong, the third performer interviewed, talked among other things about how important it was for him to sense his voice rather than rely on what he could hear back, especially when working in an outside acoustic: “I was trying to get the breath low, to feel support” (93). He found the need to release right down through his body: “You can’t let go until you ground yourself” (96). Julia Moody, Head of Voice, Western Australian Academy of Performing Arts (WAAPA), Voice & Speech Review, June 2016.